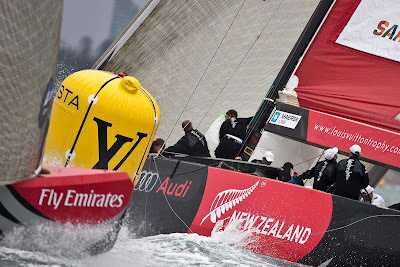 Emirates Team New Zealand came within one second of elimination from the Louis Vuitton Trophy Auckland regatta today but kept Kiwi hopes alive with a brilliant finish. Tied 1-1, the host team will sail the third race of their Semi-Final with Italy's Azzura tomorrow. 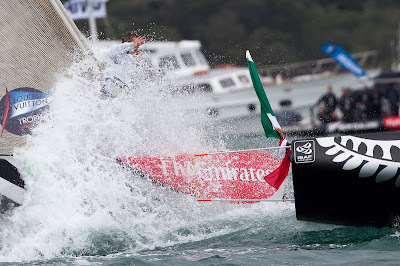 The other Semi-Final went to three races, with the Italian team Mascalzone Latino Audi, representing the Challenger of Record for the America’s Cup, defeating Sweden’s Artemis in close competition. The southwesterly breeze was lighter than preceding days, but shifts and lulls and delays in starting several races did not prevent the Royal New Zealand Yacht Squadron Race Committee and PRO Peter Reggio from starting five of the six scheduled races. They tried for a sixth race but abandoned it at 7:15pm in a fading breeze and the fading light of dusk. Although it was Friday in Auckland and a business day, a respectable-sized spectator grew in size as the afternoon wore on. For its last two races, Artemis carried a distinguished 18th man. John Bertrand, the Aussie skipper who in 1983 lifted the America’s Cup from the clutches of the New York Yacht Club, rode on the stern of the Swedish boat, forbidden from offering advice but clearly enjoying the experience. Asked about the quality of umpire calls, he added, “I think the umpires actually made good calls there, I think we slightly tacked in the last start and it was a fair call. All in all, the umpires are doing a good job and that’s part of the race. Ray Davies, tactician for Emirates Team New Zealand described the penalty before the start that almost cost them their second race against Azzurra as “a bit of an unforced one.” He said, “we were in a real strong position, and we looked to gybe with them, but as they gybed, our jib just hit their sticks (wands) as we bore away. We were able to keep control of the start. It was a bit of a trade off. After carrying their penalty all around the course, Emirates unloaded it on the finish line in a tight, foaming turn around the pin end as Azzurra bore down on them. The Kiwi boat had a 135-metre lead and Davies grinned as he estimated they needed a margin of 134 metres to pull off the win. 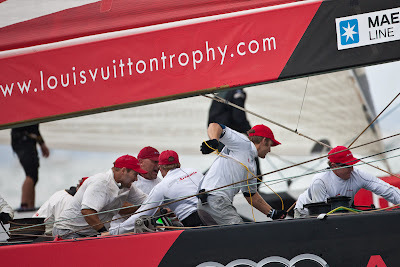 Morgan Larson, tactician on the winning Mascalzone Latino Audi, noted an extra layer in the competition between his boat and Artemis. “Terry Hutchinson and Gavin Brady are neighbours in Annapolis, so there was quite a bit on the line, more than we all know.” - http://www.louisvuittontrophy.com/.